Lundemose Bog (Danish: Lundemose) is found just north of Keldsnor Lighthouse on southeastern Langeland in the Natura 2000 area: The South Funen Archipelago. Lundemose Bog is a salt marsh spanning 13.5 ha of preserved meadows, bogs, waterholes and protected forest. The 11 ha owned by The Danish Nature Agency are dominated by calcareous fens (7210) covering and area of 5 ha and several smaller lakes and waterholes. This particular area has never been a cohesive meadow unlike the area to the south. The bog contains a potential 3-3.5 ha alkaline fen (7230), however, this area must presumably have been larger and in a better condition prior to the current state of overgrowth. The western side of the bog is defined by oaks dating from 1988. The eastern side is characterized by large 50 year old silver poplars which shade the meadow and self-sow in both forest and bog. The project must improve and expand the alkaline fen (7230) to approximately 3 -3.5 ha by clearing overgrowth and establishing all-year grazing extending to the accessible calcareous fen (7210). The project will also benefit the Triturus cristatus which possibly lives in the bog and is a species under the Habitats Directive. Triturus vulgaris, Rana esculenta and Rana arvalis are also found in the bog. Breeding birds from the Birds Directive found in the area are: Botaurus stellaris, Circus aeruginosus, Porzana porzana and Sterna hirundo. 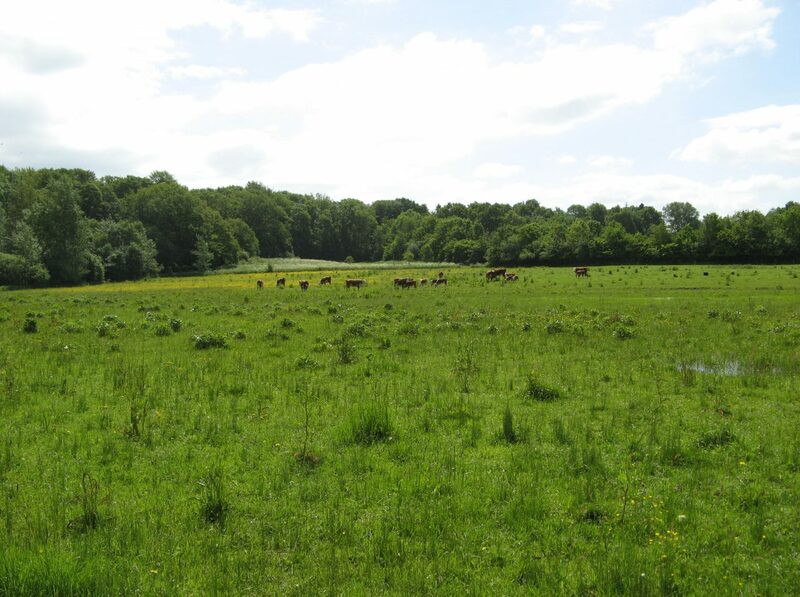 The project entails thinning out the edge of the forest, differentiated clearing and cutting in the meadow and the bog, as well as establishing all-year grazing in the area by purchasing 5-6 heads of cattle. This in turn means that 1.6 km fencing must be established alongside a shelter and drinking device for the animals. The project area has never previously been grazed in its entirety. However, a 15-40 m wide section along the edge of the bog has been grazed for longer periods of time. The majority of the areas previously grazed, are presently overgrown by reeds, tall herbs and self-sowed trees. By cutting down the silver poplars at the very edge of the forest, and establishing an area of grazing that extends 15-30 m into to the area of the bog where the silver poplars grow, it is the hope that their growth may be kept down while rendering shelter for the animals in the winter. If the poplars disappear, the view from the forest path towards the bog will be greatly improved, however, it is necessary to place a fence around the protected forest boundary. Mapped habitat types: 5.5 ha bog and waterholes. The Protection of Nature Act and The Danish Museum Act.